Working in a web agency we have multiple development teams who share development and test infrastructure. Up until now we’ve been happily installing multiple instances of Sitecore onto web servers without issues using SIM. But recently I was the second person to try and use some shared scripts to install a site via SIF onto one machine. And it was not happy. PS>TerminatingError(New-SignedCertificate): "Cannot process argument transformation on parameter 'Signer'. Cannot convert the "System.Object" value of type "System.Object" to type "System.Security.Cryptography.X509Certificates.X509Certificate2"." 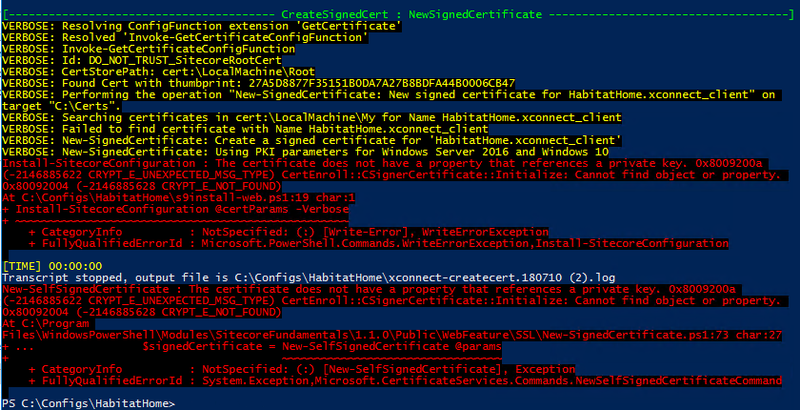 VERBOSE: Performing the operation "New-SignedCertificate: New signed certificate for HabitatHome.xconnect_client" on target "C:\Certs". PS>TerminatingError(New-SelfSignedCertificate): "The certificate does not have a property that references a private key. 0x8009200a (-2146885622 CRYPT_E_UNEXPECTED_MSG_TYPE) CertEnroll::CSignerCertificate::Initialize: Cannot find object or property. 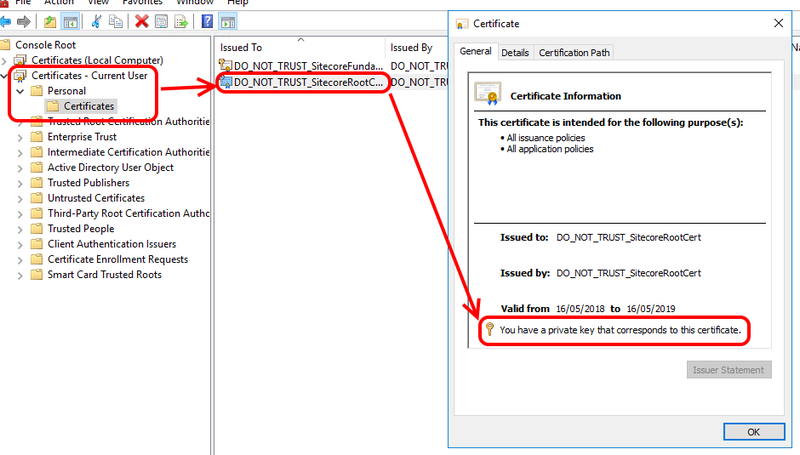 0x80092004 (-2146885628 CRYPT_E_NOT_FOUND)"
>> TerminatingError(New-SelfSignedCertificate): "The certificate does not have a property that references a private key. 0x8009200a (-2146885622 CRYPT_E_UNEXPECTED_MSG_TYPE) CertEnroll::CSignerCertificate::Initialize: Cannot find object or property. 0x80092004 (-2146885628 CRYPT_E_NOT_FOUND)"
(-2146885622 CRYPT_E_UNEXPECTED_MSG_TYPE) CertEnroll::CSignerCertificate::Initialize: Cannot find object or property. That makes some sense – you can’t use the “root” certificate to sign anything if you don’t have its private key. Signing relies on the private part of a key for its security. Checking with the person who’d done the first SIF install on this machine, their copy of this certificate did have a private key. 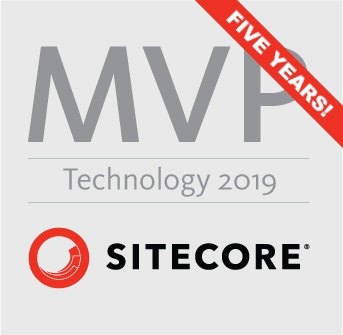 …that if you’re part of a group of devs who are sharing some “standard” SIF scripts and you happen to be the second (or subsequent) Windows user to install a Sitecore instance on a machine using them, you need to ensure that you have a copy of the original root certificate, which includes the private key. If they export the certificate including the key, and you import it into your store, then the SIF script will complete successfully. 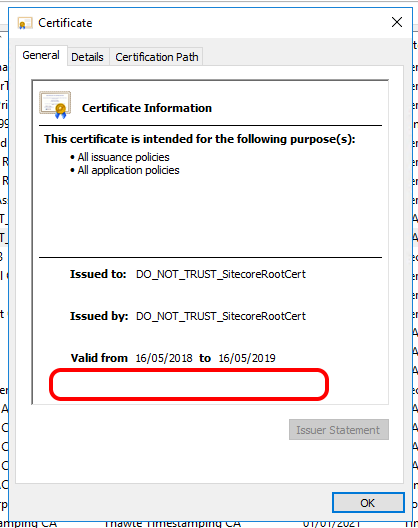 If you do want all the sites to share a root certificate, but you don’t want to have to mess about with moving certificates about, you may be able to adjust the SIF scripts to use the machine’s personal cert store rather than the user’s when generating and reading the shared root cert. It’s a pretty common requirement that deploying instances of Sitecore will require slightly different configuration on different servers. Different roles, like content management and content deployment, will require different settings and features to work. So it’s not surprising that there are a variety of approaches to how you manage this configuration in your projects. In the past I’ve often made use of separate config files, where you have a file for “config changes needed on all servers” and then further files for “config changes needed for CM servers”, and even down to the level of “config changes needed on server CD01” if necessary. This works fine if your deployment process understands which files should go on which servers.